We were invited to attend the preview as press. As always all opinions are honest and those of JustaBXfam and our representatives. You can’t tell it today by the weather in NYC but Autumn is here. That means it is time for fun fall fashion. Oh yea. Now I’m all about summer fun but fall fashion is a passion. I might not act on that passion because, the way my bank account is set up…yet, that doesn’t mean I won’t share with you. Sharing is caring you know? With the change of seasons and weather, one of the things I have to worry about is keeping the Kid properly dressed for our running dates and his regular day to day activities. 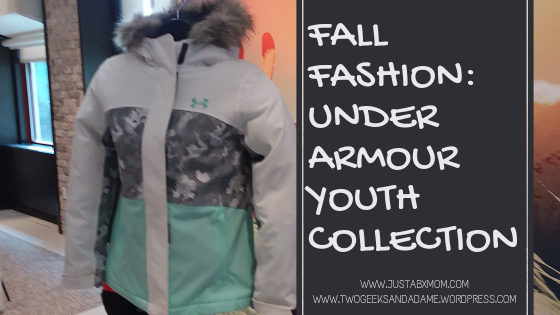 This summer I was able to attend a very cool Under Armour Youth Outerwear event. I have to say I was ridiculously excited to attend. I’ve been an Under Armour fan for years. I mostly purchased undershirts for paintball and running. Attending the Under Armour Youth Outerwear event I got to see all the wonderful products they have released for our little ones. First off the colors are AMAZING!!! I feel certain jackets they showed me could easily be worn by any child regardless of gender. I fell in love with this lovely Seaform Green, white and grey combination of colors for their Rocky Pine Jacket. It looks like a great snowboarding/Ski jacket. With a 100% waterproof shell, it will keep your Mini Boarders nice and dry. The UA Print North Rim Microfleece Jacket is great for my little runner. It has water-resistant panels, an improved durability and helps keep the rain off the body. While we haven’t done a race in the rain just yet it’s good to have a jacket like this with our crazy NYC weather $60. While I absolutely adored every jacket they had on the showcase the UA Zumatrek Jacket was definitely a fave of mine because it has the microfleece lining that gives you added warmth with a more lightweight jacket. With running and even just running around the city JELS and I are not really into bulky coats. The design they had displayed was red, black and a kind of pixelated grey pattern in the midsection. Sounds like Under Armour is going to be taking over youth outerwear to me. JustaBXgirl doesn’t like bulky jackets either and when I worked in nightlife everyone swore by them for staying warm.